2019 represents a landmark year for custom wheel manufacturer Forgeline Motorsports as the company celebrates its 25th anniversary. A 100-percent family owned and managed business, Forgeline Motorsports is located in Dayton, Ohio, and operated by twin brothers Dave and Steve Schardt. Forgeline Global Sales Manager, Steve Schardt, founded Forgeline in 1994 to address a need within the American road racing market for a custom, made-to-order forged wheel that was engineered for racing applications and made in the USA. Twenty-five years later, Forgeline continues to serve the highest levels of road racing, and their reach has grown to include high-end street applications, too. As young adults in the 1990s, the Schardt brothers had developed a passion for racing and for the wheel industry. Steve served as a club-level driving instructor, while Dave owned and operated a regional wheel distribution business called The Wheel Source and was competing in the Speedvision World Challenge racing series, which is the precursor to today’s Pirelli World Challenge series. Recognizing that serious American road racers needed a domestically produced high-quality wheel option, the Schardt family teamed up to launch Forgeline whose initial product line consisted of a single two-piece forged wheel called the RS. 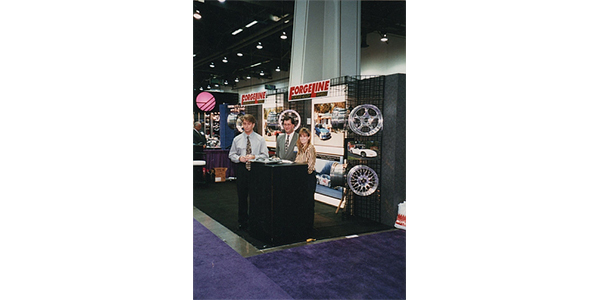 Forgeline’s first SEMA Show in 1997. Despite its humble beginnings, the RS wheel proved extremely successful. In 1995, it helped RealTime Racing’s PD Cunningham win a World Challenge class championship. Soon thereafter, it became the wheel of choice for at least half of the World Challenge field, according to the company. 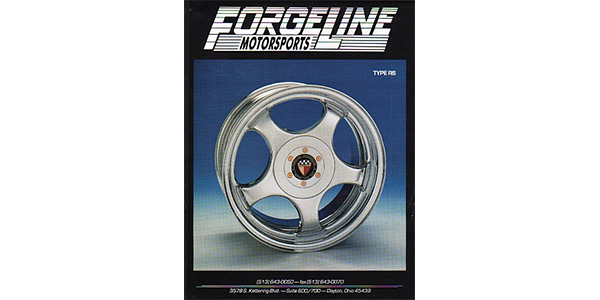 Today in 2019, Forgeline manufactures more than 120 wheel models for both the racetrack and the street. The extensive lineup includes three-piece modular wheels, one-piece forged monoblock wheels and an acclaimed “Carbon+Forged” hybrid lineup that combines precision-machined forged aluminum centers with lightweight high-tech carbon fiber barrels. Every Forgeline wheel is still custom made-to-order and precision-machined from heat-treated 6061-T6 aluminum that is forged on a 6000-ton hydraulic press to create the strongest foundation possible. This forging process aligns the grain structure, reduces porosity and increases material uniformity, allowing for extremely high strength-to-weight ratios and ensuring the most consistent quality. Forgeline wheels are hand-finished and assembled by a team of craftsman whose expertise and high standards result in products of exceptional quality and appearance. Forgeline innovation has come a long way, since the original RS wheel. Today, the company’s one-piece forged monoblock wheels have set the bar at the highest levels of road racing. Its one-piece forged monoblock GS1R has earned its way onto homologated factory racing platforms, including the Ford Mustang GT4, Chevrolet Camaro GT4.R and Panoz Avezzano GT4. The one-piece forged monoblock GTD1 wheel can be found at Nürburgring on the multi-million-dollar class-champion Scuderia Cameron Glickenhaus SCG003C.